Three Houston Independent School District schools received a 2018 National Blue Ribbon Schools award on Monday from the U.S Department of Education. The HISD schools are among 349 schools in the nation and 24 schools in Texas to be recognized. The National Blue Ribbon award is given annually to high-performing schools to showcase the hard work of students and educators. Challenge Early College High School, DeBakey High School for Health Professions and East Early College High School are this year’s HISD recipients. Each school is a previous National Blue Ribbon award recipient. This entry was posted in Achievement/Recognition, News and tagged Blue Ribbon Schools, Challenge Early College High School, debakey high school for health professions, East Early College High School on October 1, 2018 by HISD Communications. Carnegie Vanguard High School has been ranked as the 10th best high school in the country, according to the U.S. News & World Report’s 2016 Best High Schools rankings. This entry was posted in Achievement/Recognition, College Readiness, High Schools and tagged Barbara Jordan High School for Careers, Bellaire High School, Best High Schools, Carnegie Vanguard High School, Challenge Early College High School, debakey high school for health professions, East Early College High School, Eastwood Academy, Energized for STEM Academy, Energy Institute High School, High School for Law Enforcement & Criminal Justice, Houston Academy for International Studies, HSPVA, Lamar High School, North Houston Early College High School, Reagan High School, Sharpstown International HS, South Early College High School, U.S. News, Westside High School on April 19, 2016 by HISD Communications. 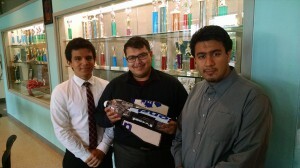 The East Early College High School’s (EECHS) Falcon 1 team, whose members are Pablo Flores, Miguel Lara, and Alejandro Meza, won second place in the High School Water Rocketry category at the 2015 National SECME (Southeastern Consortium for Minorities in Engineering) Competition. This entry was posted in District VIII - Diana Dávila, High Schools, News, Science, STEM and tagged East Early College High School, engineering, science, SECME, Southeastern Consortium for Minorities in Engineering, STEM on May 14, 2015 by HISD Communications. Students at two HISD schools brought home first- and second-place trophies in the SECME National Engineering Competition, a robotics event held in Daytona Beach, Fla. Even a security snafu at the airport couldn’t stop East Early College High School (EECHS) students from winning the grand prize. 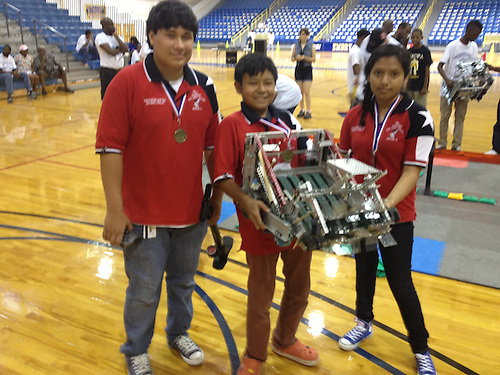 Alexandra Santos and Christopher Martinez won first place in overall VEX robotics, along with homeschooled student, Nicolas Xiong, who has been on EECHS’s team since 2011. Young Men’s College Preparatory Academy’s seventh-grade students Marcellus Jordan, Steven Jackson, and Daveon Clemons won second place in overall VEX robotics. This entry was posted in Achievement/Recognition, High Schools, Special events and tagged East Early College High School, robotics, STEM, Young Men's Preparatory Academy on July 9, 2013 by HISD Communications. Students from Houston ISD’s early college campuses showcased a few of their senior service projects to their peers on Tuesday, May 14, 2013 during the annual Senior Summit. Approximately 200 seniors from North Houston Early College, East Early College, Challenge Early College, Empowerment College Prep and the Houston Academy for International Studies watched as groups presented projects focusing on issues such as feeding the hungry, mentoring younger students, preventing bullying and promoting safe physical activity, among others. While the service projects are a requirement for graduation, college access coordinator for East Early College High School Lisa Green said many of her students laid groundwork for their projects to continue after they graduate. This entry was posted in High Schools and tagged Challenge Early College High School, East Early College High School, Empowerment College Prep High School, Houston Academy for International Studies, North Houston Early College High School on May 15, 2013 by HISD Communications. Two HISD schools were named today as 2012 National Blue Ribbon Schools by U.S Department of Education Secretary Arne Duncan. East Early College High School and Project Chrysalis Middle School are among only 269 schools nationwide and 18 in Texas that achieved the honor this year. The National Blue Ribbon Schools Award honors public and private elementary, middle, and high schools where students perform at very high levels or where significant improvements are being made in students’ levels of achievement. East Early College High School and Project Chrysalis Middle School were both recognized as “Exemplary Performing” schools. The Department of Education will honor all of the schools at a recognition ceremony on Nov. 12-13 in Washington, D.C. This entry was posted in Achievement/Recognition, Uncategorized and tagged award, blue ribbon, East Early College High School, national award, Project Chrysalis Middle School on September 7, 2012 by HISD Communications.